Donations may also be made via a credit card by filling in the donation form. Click​​​ ​​​​​ HERE to download a printable donation form. 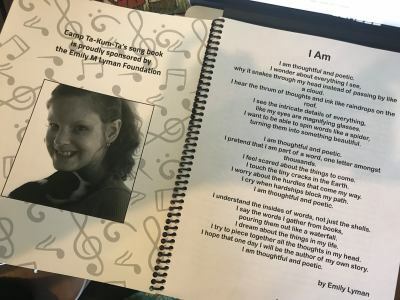 "For the past 12 years, I have been the Music Director at Camp Ta-Kum-Ta, and it is in that capacity that I write to thank you for the extraordinary generous gift of the camp's wonderful new song books. We sing at every meal, which means that we are treated to Emily's smile and her poetry, and to a book that is such a lovely tribute to her. How fitting that every time we sing - songs of laughter, songs of joy, songs of healing - we are doing so in a way that honors the memory of your daughter. Her legacy is secure in our hearts, in our memories and in our music." Over $1,000 was raised by Kathleen Porter and her 2016 Mother's Day Mini Photo Shoots.